Antonio Brown, aged 30 years old. The wide receiver from Pittsburgh Steelers weighs 82 kg (181 lbs) and has a height of 5’10” (178 cm). His intense lower body workout helps him maintain that athletic figure of 46-35-16. Very recently in 2017, Antonio Brown was seen in Madden 18 trailer in that super fit look of his. Best Known For: Having played as wide receiver in the National Football League (NFL). In a wink, the receiver plunges into action on the football field with his immense lower body strength. While the Patriots have an awesome strategy to knock out opposition’s best player, it unfortunately doesn’t apply to Brown. In the AFC Wildcard game, Brown caught five passes for 124 receiving yards and two touchdowns in a 30-12 victory over the Miami Dolphins. Keep reading to know the secrets to Antonio Brown’s endless energy and his intense workout routine. Speed alone doesn’t help a receiver unless combined with agility. Antonio Brown’s lower body workouts consist of hamstring, glutes, and weight training exercises that help him strengthen his lower body. He also incorporates cardio in his routine. His weight room exercises include three sets of eight to 10 reps of lateral step-up jumps. To do this exercise, you require an elevated surface above the knee like a chair, or a box. Put your left foot on the elevated surface. You need to push upwards. Drive through your heel, but push off your toe, while jumping laterally. Land with your right foot on the box and left foot on the floor. Jump upward again and get back to the starting position. Brown also does walking lunges with a barbell. This exercise strengthens the core and lower body and helps increase hip and hamstring flexibility. To do this exercise, place the barbell on the shoulders and step forward to go into a lunge. Stand up, step forward, and go into another lunge with the opposite leg. The key is to take big steps. The football star includes three sets of eight to 10 reps of box squats. The box squat helps develop glutes, hamstrings, and lower back, giving him power and strength for the game. To do this exercise, lift the barbell off the rack with your shoulders. Stand with a chair or box behind you. Lower into a squat until you are seated. Jump upwards and back to the starting position. Antonio Brown’s off-season workouts are also intense. He believes discipline is important to work out effectively. 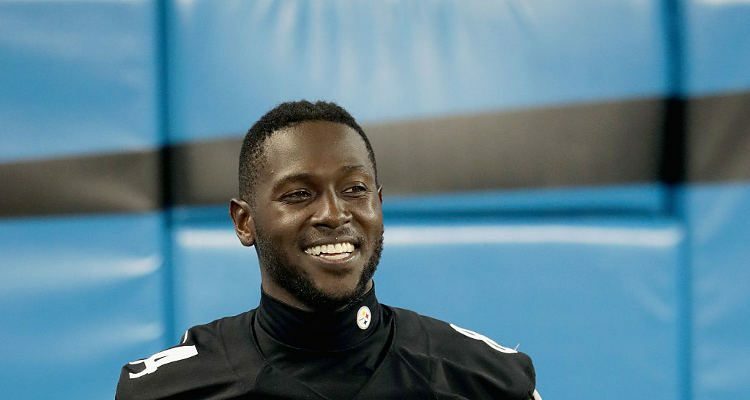 He shared his off-season routine on his Instagram account, which starts as early as 6:00 a.m.
Antonio Brown’s workout includes five sprint distances ranging from 50 to 400 meters. The number of sets increases with decreasing distance, and the total workout involves 4,500 meters of sprints. A football player needs to play at high speed intervals. Sprints with rest periods enable him to perform at high speeds. It is for that reason his workout is broken down into intervals. It also helps him maintain his speed on long and short runs. This workout helps him build a strong conditioning base which allows him recover faster during training.